My participation on the Irving Green Advisory Board has made me aware of how little I know about the environmental aspects and activities of Irving, Texas. To remedy this, I’m taking advantage of every opportunity to get involved in local activities. On Saturday, January 18, I got up early to observe and photograph a Texas Stream Team educational activity at Towne Lake Park. I noticed the event listed on Irving’s Green Events webpage and also noticed Karen Siddall’s name as the Irving representative of the Texas Stream Team. I had met Karen Siddall in 2012 through my civic hacking connections and knew she worked for the City of Irving but wasn’t aware of her exact job. Then late last year, I ran into her again at a meeting of the Irving Amateur Radio club. We talked a little about her work and I discovered she is in the Public Works department and her title is Drainage Programs Coordinator. The Texas Stream Team is a group of trained volunteers who test and monitor local water resources. The program was established in 1991 as a partnership between Texas State University, the Texas Commission on Environmental quality (TCEQ), and the US Environmental Protection Agency (EPA). It’s administered by the Meadows Center for Water at Texas State University. Unlike most government programs, this one doesn’t spend millions of dollars buying fancy equipment and paying an army of technicians. Given how many bodies of water there are in Texas, that approach wouldn’t be feasible. Instead the program relies on citizen science, in effect crowd-sourcing the project to a network of volunteers, who are trained and provided with minimal support. The field work is done by volunteers who enjoy the chance to participate or who feel a responsibility to contribute to the well being of their communities. Their work makes possible a massive data collection network at a very low cost. The event I attended was a demonstration of what a Stream Team member does. With so many bodies of water in Irving, there’s a constant need for new volunteers. Several local residents attended the demonstration to observe and ask questions. Hopefully a few of them will choose to become team members. So what does a Stream Team member do? Each team member is assigned one body of water. They select a day of the month and time of day that works for them. At the chosen time, once a month, they visit their location and make some simple measurements and observations. The measurements are made using basic tools in a provided standard equipment kit. Data collected includes ambient temperature, water temperature, dissolved oxygen level, conductivity, pH, water clarity, and a few other field observations. 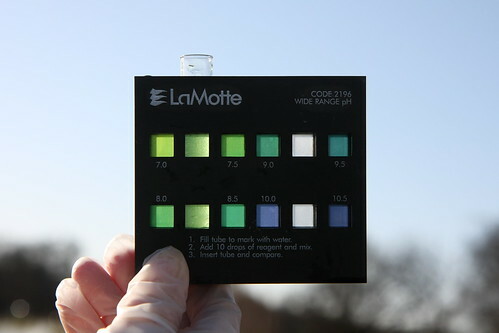 To keep the costs down, the test kit uses very basic tools like a plastic Secchi disk and a thermometer instead of the modern digital instruments costing thousands of dollars. Of course, that means instead of just pressing a button, team members have to learn some very simple chemistry but the procedures are easy to learn and well documented. The data collected by Stream Team members goes into a database at Texas State University, where it can be monitored and used by various government agencies. The data is also available to researchers and to the general public. You can browse some of the recent data from Irving by going to the Texas Stream Team data viewer and selecting “City of Irving” from the “group” drop down field. For example, here’s a listing of data for the Towne Lake Park site that I visited: Towne Lake Park gazebo, site 16269. Even with several people watching and asking questions, and with me stopping her periodically to shoot photos, Karen was able to complete the entire data collection procedure in about an hour. Without us there, she probably could have done it in a much shorter time. So a volunteer is only giving up about one hour a month to help maintain and protect their city’s water resources. If you’ve been looking for a volunteer opportunity that gets you out of the house, doesn’t take much time, and provides a real benefit to your city, the State of Texas, and the environment, this might be what you’re looking for. You can find out more about the Irving branch of the Texas Stream Team on their facebook page. If you live in another Texas city, visit the Texas Stream Team partner list to find out who to contact in your city. And, if you’re curious, you can see my full set of photos documenting the morning’s events.